Healthcare practices and organizations tend to accumulate an extensive amount of paperwork over time. Numerous patients are seen on a daily basis, and multiple records are retained for one patient alone. When it comes to accounting for the hundreds upon thousands of documents that must be kept on file, some type of organized system is imperative in order for your office to be able to operate smoothly. More and more practices have begun to make the switch to an electronic health record (EHR) system in order to maintain such an overwhelming amount of information. However, this transition can be a painstaking and expensive process. Implementing an EHR system can greatly improve the functionality of your overall medical records management system. However, there are a few setbacks that some users have experienced. Not only can making the conversion to an EHR system become highly stressful, but many providers have been found to be less than pleased with the system that they chose. Therefore, it is crucial when making this investment to ensure the system is best fit for your specific needs. 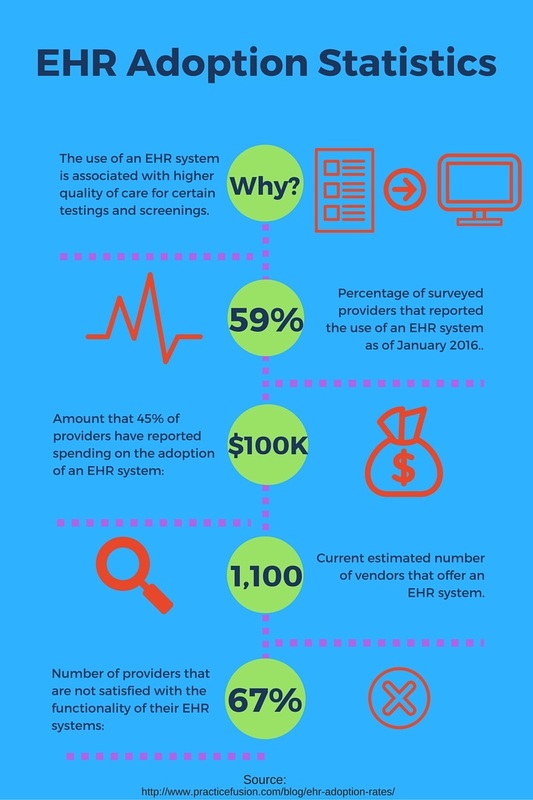 As you can see, more than half of surveyed providers have reported making the switch to an EHR system, but well over half of those providers are unhappy with the functionality of their system. Among the frustrations regarding EHR functionality are “poor usability, time-consuming data entry, interference with face-to-face patient care, inefficient and less fulfilling work content, inability to exchange health information between EHR products, and degradation of clinical documentation.” This has been reported to have negative effects on physicians’ attitudes towards their career. Furthermore, with the cost that almost half of providers have spent on an EHR system being well into a six-figure investment, there is little room to pick the wrong option unless you are willing to waste close to $100,000 or more. Do You Need Help Finding the Best Electronic Health Record System for Your Practice? Call Us Now! The right EHR system will allow your medical organization to operate significantly more efficiently in order to provide your patients with a higher quality of care. Record Nations understands that each practice is unique, and can help you to decide which system is the best fit. We partner with a nationwide network of contractors that will work to make the conversion as quick and painless as possible, no matter where you are in the country. To receive free, no-obligations quotes on an EHR system, simply fill out the form to the right or give us a call at (866) 385-3706. Within minutes of speaking with our agent, you will be contacted with affordable quotes from industry professionals that are prepared to compete for your service.